I commissioned artist JC MCNAMEE to do this piece and he really nailed it. 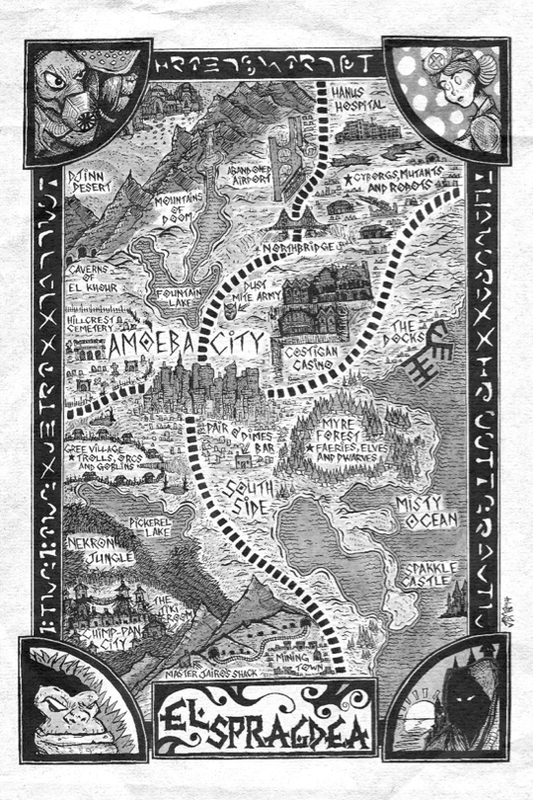 I grew up reading the Conan novels published by ACE, and I wanted Broadsword's 1st book to open up like those classics with a detailed map of the world you're about to enter. I filled it full of Robert E. Howard references. (El Spragdea is a reference to L. Sprague De Camp.) At first, I was going to draw it, but then I grew curious to see what JC would do with it. He has a raw, unique style that perfectly matches this brutal apocalyptic world. He even went the extra mile and designed the runes around the border. (Yes, they actually say something.) It was also his idea to add the baddies in the four corners. These guys look sick and demented. I couldn't be happier. Now to place this with the rest of the pages and finish the dang book already. To be continued... To see more from JC go here.